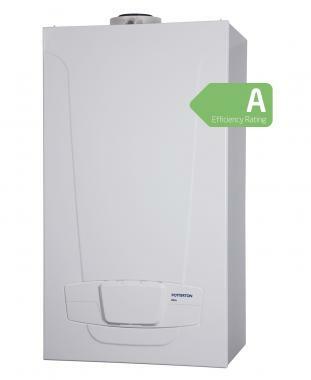 The Ultra system boiler from Potterton is a highly reliable condensing and wall mounted unit. This boiler comes with a variety of features and benefits to help make it such an dependable boiler. This boiler comes with an output rating of 21kW making the unit perfect for the medium sized homes that don't have an excessive need for hot water or heating. This boiler also has a variety of other outputs including the 12kW, 15kW, 18kW, 21kW and 24kW making it able to suit anyone needs. This unit, being a system boiler, sends hot water to the radiators and a sealed hot water storage cylinder. The important parts of the system are built into the boiler which makes it more compact and easier to service. This boiler features a leading choice of flue lengths for versatile siting. The boiler is ideal for both replacing a boiler in a old home as well as for the new build homes. This boiler can be pre installed using the pre plumbing jig. It is lightweight and compact in size making this boiler perfect to be hidden away out of sight and out of mind saving you space. This boiler is fully modulating. It’s compatible with the Multifit Gassaver, helping to save you up to 37% on your gas and water bills. It is also compatible with the Megaflo eco solar cylinder, another great way it can help to save you money. This unit has flueing options of up to 20m long - another way it helps for flexible siting. This boiler has a NOx class of 5 helping to make it a super quiet boiler while in operation. This boiler also features a robust hydraulic connection to offer security that you have got a high quality and reliable unit. This boiler comes with a standard 2 years warranty.